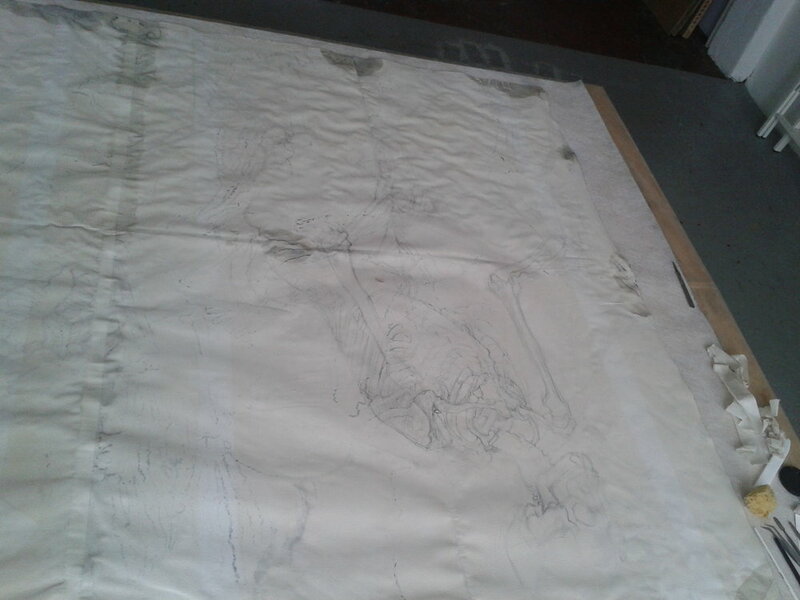 A Battle of Skeletons was one of several very large mixed-media drawings requiring stabilization for an artist's retrospective. This situation was somewhat unique in that the artist had hired me independently to conserve the drawings in his studio. Some were still works in progress, and all were very large and assembled from smaller sheets of very soft Fabriano Umbria watercolor paper which had been adhered together by the artist or his assistant using strips of paper and wheat starch paste on both the recto and verso. This treatment report focuses on A Battle of Skeletons; other large charcoal and gouache works on paper were lined with Japanese tissue and flaking media on the recto was consolidated with methylcellulose or wheat starch paste. For Battle, as the strips on the recto had been covered with a ground and drawn/painted over, treatment was focused on the verso. 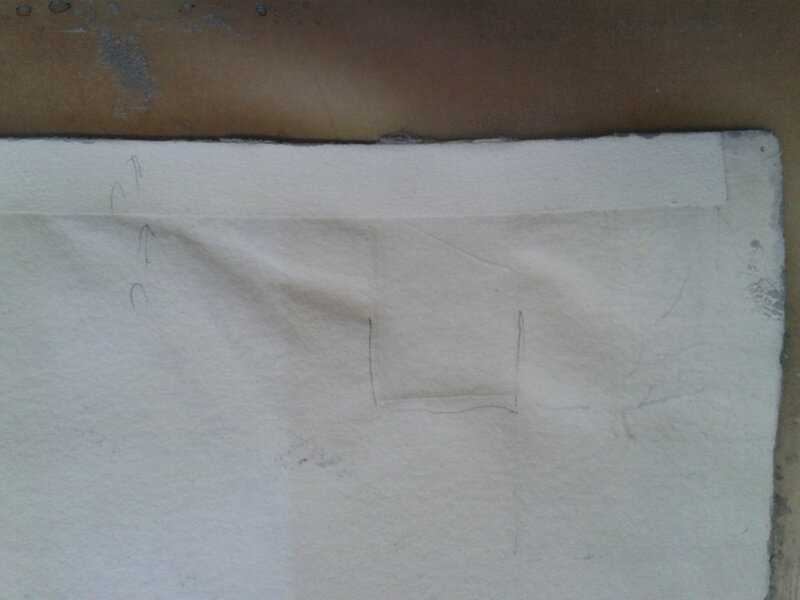 The drawing exhibited severe planar distortions near areas where the smaller sheets of paper had been joined together with heavy paper joints. 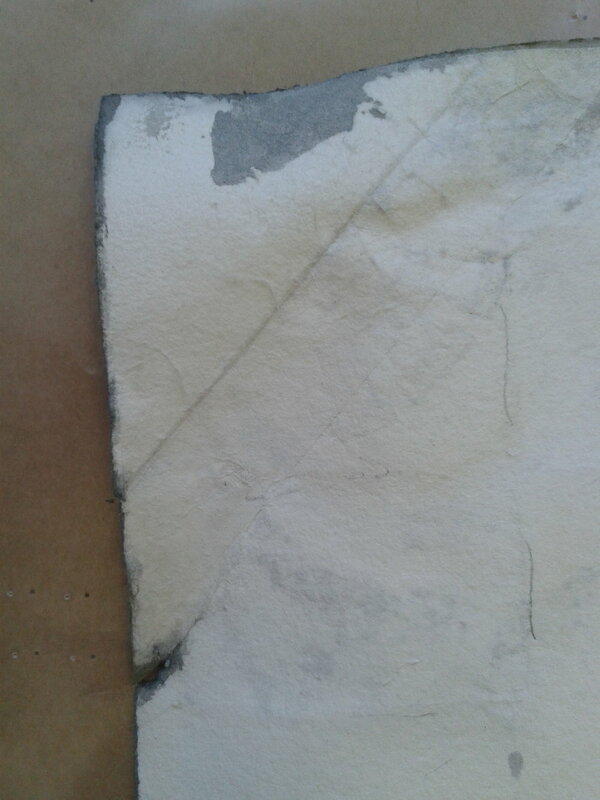 The resulting tension between the paper surface and the joints had not only resulted in tension on the paper, but also tears and media loss in some places. After testing for media stability, the object was turned face-down so that the old paper joints could be removed from the verso of the drawing. Old joints and unsuitable repairs were removed using humidification and gentle mechanical methods. The entire piece was then humidified and pressed between non-woven polyester, blotter, and boards, and materials where changed out until the entire item was dry. Once the object was suitably dry and planar distortions had been relaxed, new joins were applied using medium-weight Japanese tissue and wheat starch paste. The tissue was light enough that it didn't cause tension between sheets of paper, but it was heavy enough so that it was able to support the joined areas. Once the new joins were in place, tears were mended and fragile corners were reinforced with tissue and wheat starch paste. Areas with flaking media on the recto were consolidated with wheat starch paste.